I have just released version 1.2 of SPClientSideDeployment. 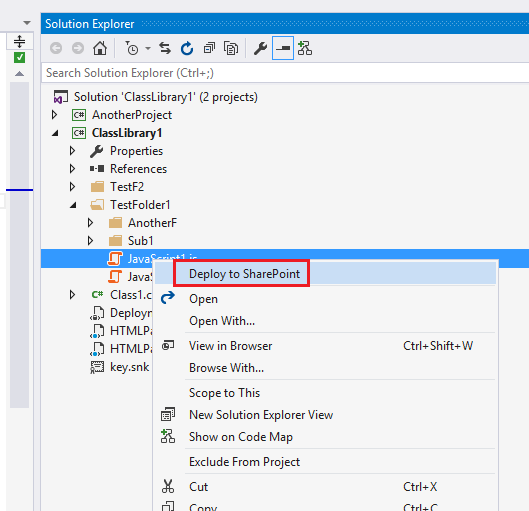 This version adds a “Deploy to SharePoint” context menu to files and folders in the Solution Explorer. With this addition, you can now selectively deploy files that you typically don’t open in the code editor, such as images. For folders, this command deploys all files within the selected folder(s) and their sub-folders. Multiple selection of files and folders is supported. Note that the command is not available for code files (i.e. .CS or .VB files). Selecting files and folders across multiple projects is not supported.